Just today Google announced and rolled out a long-awaited feature to the Google Play Store, the ability for developers to create promo codes for users to use towards an app or in-app purchase! The feature is pretty straight forward from the user perspective. 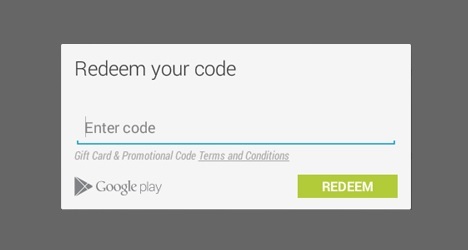 The developer provides the user with a promo code that the user then redeems through the Play Store on their device. It is as simple as entering the code provided by the developer and then installing the app. From the developer side it is a little more complicated. Emphasis on little, the process is super easy! As a developer you go to the Play Store Developer Console, select the app you want the promo codes for, select the new Promotions menu item, enter a name for the promotion, a start date, an end date and the number of codes you want generated. Once you’ve completed the fields you generate the codes and then download them in a CSV format. You then give the codes to the users to redeem and are good to go. There are two caveats for the developers. First, you can only create 500 each quarter. Second, any unused promo codes at the end of the quarter are not rolled into the next and become invalid. To celebrate this feature that we have been waiting for for such a long time I am giving away ten promo codes to the Pro version of my wallpaper app, Rwilco12’s Wallpaper Gallery (normally $1.49). Reply to my tweet on Twitter to claim yours! Final Fantasy for Android By Square Enix On Sale Now!